On Saturday, January 26, a group of board members from Friends of the Edmonds Library attended the Midwinter conference of the American Library Association in downtown Seattle. Several library staff members also attended the full event. We are always looking for ways we can improve our service to the community and bring forth the unique perspectives of our membership, so we’re sharing with you, our fellow library advocates, some of the key insights and resources we learned about at this event. Thanks for all you do to support our local library and its widespread impact! United for Libraries is a national association of library trustees, advocates, friends, and foundations. This half-day workshop kicked off with a keynote from sociologist Eric Klinenberg, whose recent book, Palaces for the People, makes the compelling case for the role of libraries as essential components of social infrastructure. We also learned about The E’s of Libraries – a simple and effective model for answering the sometimes loaded question of “what do libraries really do nowadays, anyways?” Education, Employment, Entrepreneurship, Empowerment, and Engagement – that’s what! For everyone, everywhere. Did you know that National Library Week occurs in April each year? 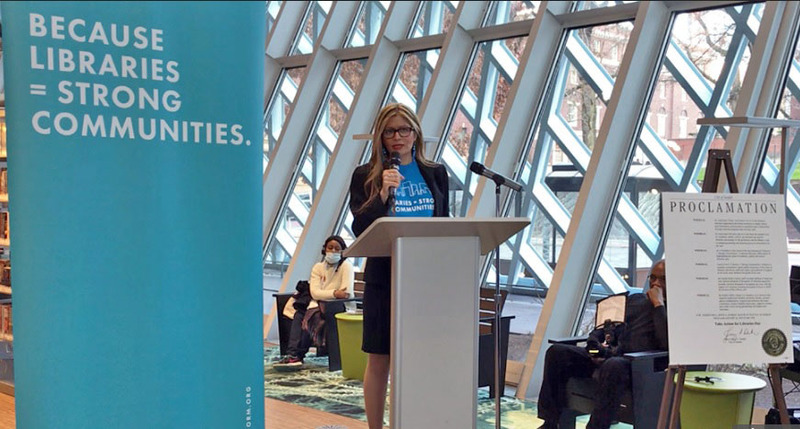 This year, as part of National Library Week, Washington libraries will lead a growing effort to promote a Library Giving Day on April 10, 2019. Friends and other ambassadors are leading the effort to bring new voices and supporters to libraries all across the country. The Public Libraries in Aarhus (Denmark) and Chicago (USA), with funding from the Bill & Melinda Gates Foundation, created the Design Thinking for Libraries toolkit to introduce a way of working that will help libraries understand the needs of their patrons and engage their communities like never before. Design Thinking allows libraries to work together to discover what their communities want and experiment to create services, programs and processes to meet their changing needs. The toolkit is free and available here.